Press Preview: Friday, June 8, 2018, 10:30 a.m.–12 p.m.
Norman Rockwell (1894-1978), Shuffleton’s Barbershop, 1950. Oil on canvas, 33 x 31 in. Cover illustration for The Saturday Evening Post, April 29, 1950. Collection of Lucas Museum of Narrative Art. Stockbridge, MA, May 16, 2018– Norman Rockwell Museum Director Laurie Norton Moffatt today announced that Shuffleton’s Barbershop, Rockwell’s acclaimed 1950 painting recently acquired by the Lucas Museum of Narrative Art, will go on view at the Rockwell Museum beginning June 9. The painting, acknowledged by many as a masterpiece, joins the Museum’s landmark exhibition Keepers of the Flame: Parrish, Wyeth, Rockwell, and the Narrative Tradition, on view from June 9 through October 28, 2018. It will then remain on view at the Museum in a series of themed presentations. With its acquisition of Shuffleton’s Barbershop, the Lucas Museum announced a cross-country partnership whereby the painting will be on long-term loan to the Norman Rockwell Museum for public display until 2020. The Lucas Museum will additionally explore opportunities to loan the painting to other museums in Massachusetts and elsewhere following its residency at Rockwell Museum, in order to maximize public access to this beloved work of art. It will then be featured at the Lucas Museum, opening in 2022, where it will continue to be on public display. A work of compositional complexity and emotional subtlety, Shuffleton’s Barbershop depicts a trio of amateur musicians enjoying an evening of music in the warmly lit back room of a barbershop, a daily hub of community life. 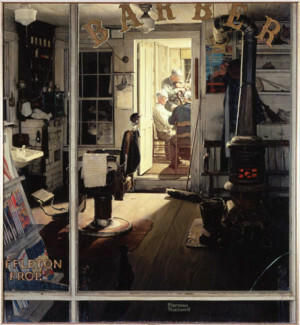 The painting depicts the artist’s hometown barbershop, which he and his family frequented while living in Arlington, Vermont. Rockwell posed the shop’s proprietor, Rob Shuffleton, as the fiddler in the back room, though he was a sportsman rather than a musician in real life—as attested to in the rifle and fishing tackle in the front room. Painted for The Saturday Evening Post cover of April 29, 1950, this work in oil on canvas measures approximately four by four feet, and it is riveting in its detail. While Rockwell’s subject is one of everyday people engaged in a familiar activity, the scene is illuminated by a light that may fairly be described as transcendent. Our eye is led through a myriad of details, including a cat, a basin, a magazine rack, the fishing tackle, the rifle, a gooseneck lamp, men’s boots resting by the glowing cast-iron stove, and many more that, together, give a vivid sense of time and place. All of this is glimpsed by the viewer, who, positioned on the street outside the shop, must look through a cracked window, seeing, but not hearing, the music being played. Shuffleton’s Barbershop speaks powerfully about community, revealing both Rockwell’s affection for and understanding of the rituals that define daily life for his neighbors and friends, and his unerring ability to celebrate the commonplace among us. The curatorial team at Norman Rockwell Museum is planning further ways to explore Shuffleton’s Barbershop following the conclusion of Keepers of the Flame. Details will be announced at a later date. Keepers of the Flame will shed light on the thread connecting American narrative art—as embodied by legendary illustrators Maxfield Parrish (1870–1966), N.C. Wyeth (1882–1945), and Norman Rockwell (1894–1978)—to the roots of European painting, tracing the long line of teachers who, through the centuries, passed wisdom, knowledge, and techniques to the next generation of creators. Organized by the Norman Rockwell Museum the exhibition comprises more than 60 works by American and European masters that have been culled from public and private collections from across the United States. These include works by Robert Vonnoh, Thomas Anshutz, George Bridgman, Henry Siddons Mowbray, Howard Pyle, and Thomas Eakins, on display next to the work of mainstays of the French academies of the 19th century, including Jean Léon Gérôme, William Bouguereau, Paul Delaroche, Henri Lehmann, and Mark Charles Gleyre, among others. Norman Rockwell Museum will host a Berkshire Community Day on Sunday, June 10, on the opening weekend for the Keepers of the Flame exhibition, including Shuffleton’s Barbershop. Berkshire County residents will be offered free admission to view the exhibition and the beloved painting.